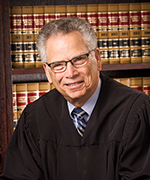 Justice Perren was confirmed as an Associate Justice of the Court of Appeal in the Second Appellate District in 1999 after serving for 17 years as a Superior Court Judge for the County of Ventura. As a trial judge, he presided over hundreds of Criminal and Civil Trials as well as serving in the Family Law department. He was the Presiding Judge of the Ventura County Superior Court in 1992 and 1993. His most gratifying assignment, however, was serving for five years as the Presiding Judge of the Juvenile Court. For this service he was honored to have Ventura County's Juvenile Justice Center bear his name. In 1984 and again in 1998 he was recognized by The Ventura County Trial Lawyers as its "Trial Judge of the Year." Born and raised in Los Angeles, Justice Perren received his undergraduate and legal education at U.C.L.A., and was president of the law school class of 1967. Following graduation he served in Vietnam as a Captain in the ArmySignal Corps and served additional dutyas a military prosecutor and defense attorney. Upon discharge he returned to California where he served for three years as a deputy district attorney for the County of Ventura. Thereafter he entered private practice working as a civil and criminal litigator until his appointment to the bench in 1983. In addition to his work in the courtroom, Justice Perren has served on and chairedthe Judicial Council's Criminal Law Advisory Committee, served on the Jury Instructions Task Force (Criminal) which yielded CALCRIM, the update in understandable English of the standardized criminal law jury instructions, and has been a member of the Executive Committee and vice-president of the California Judges Association and the President of the California Judge's Foundation. He currently serves on the Commission on the Future of California Courts. He has been a lecturer at the California Judicial College on sentencing practices, juvenile justice and jurisprudence. He has testified before the California Legislature and the Little Hoover Commissionon sentencing issues and has participated in numerous panels and forums dealing with criminal justice. He authored, “Indeterminate Sentencing Redux: A Return to Rational Sentencing.” (22 FSR 165 - February, 2010.) Justice Perren was honored in 2003 with the U.C.L.A. School of Law Alumni of the Year Award for civic activities and, in 2007, with the California Judges Association "Alba Witkin Humanitarian Award." He was awarded an Honorary "Doctor of Laws," by California Lutheran University in 2002. Justice Perrenis married toDiane. Their daughter is an associate professor in the Department of Communications at The University of Texas (Austin).